Differences between a conversion van and a Class B motorhome are often confusing for anyone trying to determine the difference between the two. Each product is different and meets different traveling needs. We will try to clear up the confusion with the following information. Some manufacturers, dealers and even owners may refer to their conversion van as a camper van, mini motorhome, or simply a Class B motorhome. In RV lingo, a standard conversion van started out as a passenger van or cargo van and was then converted or customized. Many standard conversion vans have a raised roof to increase headroom and all conversion vans are built on a cargo van chassis and can typically transport 6-8 people in style. They may have custom paint, four captain’s chairs, and a TV/DVD combination. A standard conversion van can be customized by the consumer for sleeping and eating but is not purchased directly from a factory with sleeping, eating and bathroom facilities. These types of vans would be used for a consumer who likes to go camping but doesn’t want to use a tent or purchase an RV. You would still pack like you are tent camping with the outdoor gas stove, water jugs and cooking supplies but would sleep in your enclosed van protected from the elements. 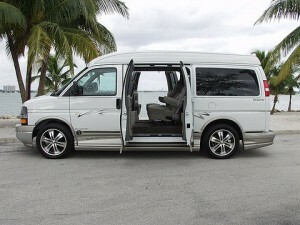 Not only are conversion vans often used as a second vehicle for family transportation; they are also popular due to their ability to provide wheelchair access and are often used as a primary means of transportation. These converted wheelchair vans can come in a variety of sizes and are also custom built. They are converted in a way as to provide the wheelchair access and still have ample room for others to enjoy, in comfort, transportation or travel. A conversion van that is customized to include a sleeping area, bathroom and small kitchen would be classified as a Class B Motorhome. Most Class B’s have been modified by extending the chassis which adds additional living space. A prime example would be the Airstream Interstate which has an extended chassis and includes many of the same amenities one would find in a Class C motorhome. We do not rate conversion vans in our Motorhome Comparison Guide but we do rate Class B and B+ motorhomes. Our Motorhome Comparison Guide is an excellent RV resource for anyone considering a Class B or B+ motorhome. 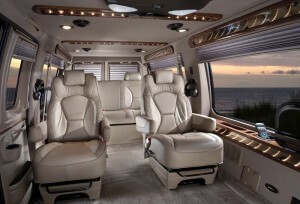 We have spent the past year researching the RV industry and interviewing Class B manufacturers. Now for the first time a RV rating guide reveals which RV companies have the best customer service, overall quality and high resale value. Don’t delay – get yourself a copy of our popular Motorhome Comparison Guide and become an educated buyer.